April 7th marked the date of UT Idea Lab's long-awaited product and service design workshop. 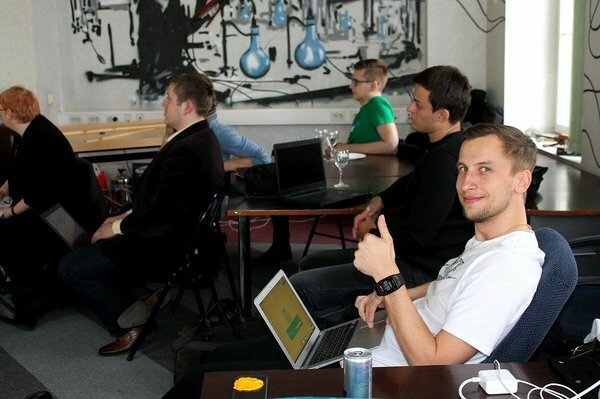 The workshop took place at Tartu's own Silicon Valley – Garage48 HUB, where more than 50 people had gathered to listen to Yrjö Ojasaar. Moderator for this event was Yrjö Ojasaar who was born in Estonia but who has spent most of his life working and living in the United Stated of America. He has an extensive background in law and business. Additionally, he is a mentor and an advisor at Startup Wise Guys and at GameFounders. Ojasaar explained how to bring new ideas into your business without putting too much strain on your wallet by bringing examples from his own experience. He brought out that the most essential part of product and service design is defining your product and working out the whole concept. Ojasaar also repeatedly emphasized the importance of the customer experience. "Every CEO should experience the full customer process of their product. It can be an eye-opening experience. [---] It has to be more than just you behind the table assuming things. It's going to make you look like an a**," said Ojasaar. Through his enticing speech, useful tips and light (somewhat American) humor, Yrjö Ojasaar truly captivated the crowd. The practical part of the workshop gave the represented UT Idea Lab teams a chance to get feedback on their projects. The represented ideas included a device that measures the amount of antibiotics in your body using just a small drop of blood, a web platform that helps tenants easily find a place to rent and a website that allows people to buy and sell heating devices such as firewood and pellets. Team MoeLeid has an idea for an app that would change our shopping experience much more simple by allowing us to browse different store items from our phones. The team said that they took many pointers from the workshop. "We have to think the whole project through, like what can go wrong and how to act accordingly," said Astrid Pung from MoeLeid. The next Idea Lab workshop will take place on the 14th of April called "Web Design Workshop" and it will be 100% practical. The moderator for this workshop will be YourDesignWorks founder and mentor Helen Kokk. YourDesignWorks helps entrepreneurs reach their goals through design, taking customer comfort into extra consideration.